This morning I went outside to plant a few blueberry bushes that I have been meaning to get in the ground for over a week. 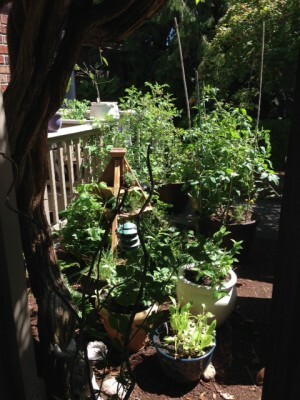 On my out the back door, I noticed how lovely the sun looked shining on my little kitchen container garden. Outside the patio door is a very old trumpet vine and I think it frames the kitchen garden in such a nostalgic way. So naturally, before I made it to the blueberries I sat down and had a cup of coffee and enjoyed the view. This is one of the perks of staying at home and raising babies, coffee on the patio at 10am on a Wednesday. Everything in the container garden is looking great, tomatoes are plentiful and beginning to ripen. The herbs are fragrant and spilling over the strawberry planter. The strawberries seem to be close to finished for the season as are the sugar snap peas. I planted bush beans yesterday and am thinking I will do another pot of carrots. I eventually made it into the back yard and got the blueberry bushes planted up with some compost. I planted them near this fairytale sign I made months ago. 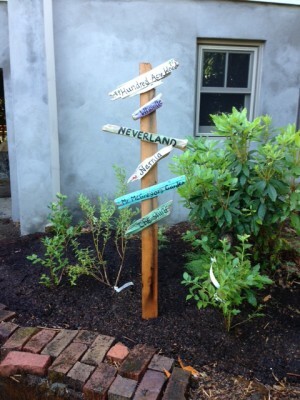 I saw this idea on Pinterest about a year ago and thought it would be great in our yard with all the various pathways. I’m really trying to incorporate a sense of play and wonder with our yard. I think it is particularly important for kids to be inspired to use their imaginations these days. Likewise, adults need a little playfulness, especially when there is so much work involved with gardening. Good to keep a sense of humor or you’ll be incredibly discouraged. After I planted the blueberries, I watered the plants in the front yard and thinned out my Japanese maple. Another hot day in the Pacific Northwest and now that I’ve broken a sweat outside, I can get to those dishes I have been ignoring. Hope you get some time to enjoy outside today. Great post!! And “Journaling” is the way to go. I think it’s a more personal approach and either someone will click with what you are writing or they won’t. They will learn something or they won’t. That’s what I do. I just do it for me and whatever spits out of my little typing fingers sometimes at midnight, is what you get. 😉 Seriously, after reading this post, it made me want to go trim our dumb Juniper bush. But I am tad exhausted. (worked last night) It also made me feel less guilty and that there is someone else in this world that has my sort of timeline. Wake up, coffee on the front porch for me, feed the kids, then maybe get around to do the dishes, pay bills and throw another load of laundry in. Oh ya… and figure out what to do with the kids today. 🙂 Good Job! I’m inspired! BTW… my latest blog post has a tiny photo of Gav from 4th of July 2 years ago at the beach.